Deleted Emails Linger in Yahoo Accounts: Root Them Out! This week, I responded to a message in a yahoo group, which I rarely do. It was the only response to the message which had been reposted just days ago, so I figured they wanted a response. I was surprised then that a couple days had passed without one, so I logged in to send another message. This time, I was using my phone and when I got to the compose interface, it showed that I still had an old email address as the email I was “sending from”. I thought, “Oh, well that’s why I didn’t get a response. I didn’t update my yahoo account when my old email address got deleted.” So I sent a quick message, noting that they should respond to my new email address, and then went about updating my account info. However, once I got to my account page’s “Email Preferences” tab, it showed that I had already updated the account with 2 new email addresses and had already deleted the old one. I then double-checked the yahoo group message interface and noted on my computer that it doesn’t even show what email you’re “sending from”. I switched back to my phone to compose the message, and there it was, the old email address again! Both of those links insisted on making my profile public, which I did not want to get into. Besides, I didn’t know what “unbounce” meant – all I wanted to do was delete it. I started googling around and found (surprisingly) zero information about how to fully delete an email address from your yahoo account that doesn’t show up under the “Email Preferences” tab (which is why I decided to create this post). 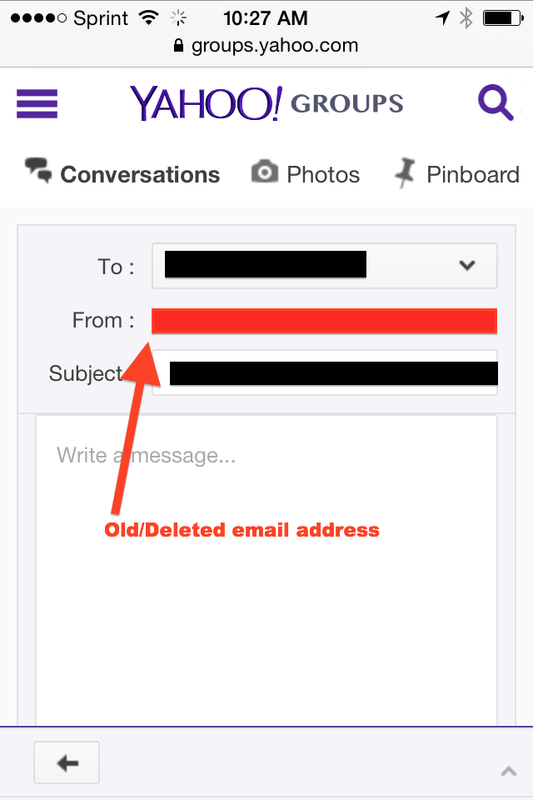 So if you ever delete an email from your yahoo account, and even if you assign a new email address as your primary email address, make note that you will have to delete the old email address again under the “Manage My Groups” tab. The next time you go to edit that page, your old email address will have disappeared. I’ve been playing around a lot lately with different ways to get reminders other than at specific times and using geofences using the iOS Reminders App. I’ve got a second post in the works for my experiences with WeMo motion-based notifications, but I was excited to learn about iBeacons and was eager to try it out. This post will detail my early experiences with successfully setting up my iMac at work as an iBeacon and getting reminders from it on my iPhone 4S. When I started looking for iBeacon software, there was no free out-of-the-box way to set them up that I could find. There’s code available and tutorials on how to write the code, but nothing that I could find that gave a layperson’s perspective on how to get it going. I didn’t want to get into a new coding project. I just wanted to use what was available. This post will show you how to turn your office computer into an iBeacon and get reminders when you get to your office or when you leave your office. It uses, and is based on the excellent code and article for BeaconOSX by Matthew Robinson. Why would someone need this? The Reminders app has location-based reminders, you say? Well, location based reminders in the Reminders App are based on geofences, which are not very accurate. You get the “when you leave” reminders after you’re a ways down the road, or sometimes even miles away. Same goes for the “when you arrive reminders”. At those times, you’re not paying attention to your phone, you’re looking at the road, and the reminder frequently goes unnoticed or forgotten. With iBeacon reminders, you get “indoor-level” location based reminders, like when you step into a specific room. When you get to your desk, you get reminders relevant to that setting. So it’s really handy when setting reminders to make that important phone call or not to forget your gym shorts. Unzip the file by double-clicking it. Double-click on the file named “BeaconOSX.xcodeproj”. You might be asked to approve new software to be installed. If so, click “Yes”. Click the “play” button in the top left corner of the XCode. Paste that UUID into the top field in the BeaconOSX window and then click “startAdvertising”. Lastly, we need to install, run, and configure our iOS iBeacon reminders app. We’re going to use Proximitask. Though there may be others out there, this was the first one I was able to get to work. Proximitask is nice because you can enter the same values that BeaconOSX takes. We now need to tell Proximitask about our new beacon. Swipe left until you see a button that says “Add New Beacon”. Touch that. Give the beacon a name (I chose “Office”). Enter the UUID, Major, and Minor values that are in your BeaconOSX window. Now, you simply need to restart your computer (and possibly your iPhone). Launch BeaconOSX and click “startAdvertising” again, and you’re good to go. Proximitask has 2 categories of reminders, “Upon Arrival” and “Upon Exit”. When you click the “+” icon, you will be able to either create a new task for the highlighted category (“Upon Arrival” or “Upon Exit”), or select one to import from the Reminders App. You can feel free to play around. The tasks in Proximitask can be deleted and it will not delete them from the Reminders App. Some notes… I have yet to play around with/tweak the power of my iBeacon signal. I’m getting my reminders well outside of my office. In fact, my “Upon Exit” reminders are being triggered after I leave the entire building as opposed to exiting my office door. Tweaking the signal strength might improve that, but I’ve yet to play around with the settings. It might be that even if I tweak the settings, I might not get the “Upon Exit” reminders in a timely fashion, as I’ve read that some people have experiences spurious triggering of beacon notifications while their phone is right next to the computer. My guess is that if the signal disappears, Proximitask keeps looking for it for awhile before deciding that you’ve left. This is probably an attempt to prevent spurious triggerings of notifications. Also, I have not yet configured a way to keep BeaconOSX running through restarts. You can definitely add it to your login items under System Preferences->Users & groups->Click your account->Login Items, but that won’t start up the iBeacon Signal. You’ll still have to click “startAdvertising”. I may whip up some AppleScript to get that going at some point in the future. I only this week got this all up and running and will report back on my experience after I’ve been using it awhile. Have fun playing around with it. Sorry for the image quality of the above pic, but as you can tell from the title of this article, I’m having some bluetooth (BT) issues, and as such, my BT keyboard wasn’t working, so I couldn’t take a proper screen shot. Last night, my 2 bluetooth peripherals (keyboard & headphones) started going crazy and I’ve yet to figure out the cause or solution. One thing I did last night (10/1/2014 at 7:30pm according to my log) before this all started happening was I performed a system update using “Software Update”. It installed the Security Update 2014-004 and iTunes 11.4. It could be a coincidence, but that’s awfully coincidental. It also follows a recent iCloud issue from the night before. The previous time I used the computer, I was having trouble using bonjour for screen-sharing with my first-gen iPad running VNC, so I had connected to another computer on the network to use Back-to-my-Mac. But then I realized it wouldn’t work because I’d recently changed my Apple ID password. I couldn’t figure out how to re-enter the password in 10.7, so in iCloud System Prefs, I logged out of iCloud & back in (both of those processes took forever and I just turned off the screen and let it run all night). So then last night I was checking in on the iCloud status and got asked for my password. So I turned on the first of my BT devices (Apple Keyboard) and tried to enter the system password. But it kept saying I was entering the wrong password! Eventually, I opened up a Stickies Note and tried typing there and everything was coming out all-caps. The caps-lock key wasn’t lit and turning it on/off didn’t change the capitalization. I opened Apple’s virtual keyboard and it showed that I was holding both the caps-lock and shift key down. I managed after a few tries to get them off, but then when I tried to enter the password again, it still wouldn’t work. So I looked at the virtual keyboard again and it showed that the option key appeared to be depressed. I turned that off using the virtual keyboard/mouse & continued. Then the virtual keyboard started opening up on its own. At one point, it appeared to open every time I hit the shift key and other times, it just randomly appeared all on its own. Every time I managed to get a modifier key turned off using the mouse & virtual keyboard, another one would pop on. I tried everything I could think of. The keyboard was at 65% battery power. I cycled bluetooth, cycled the power, etc.. No luck. So I turned off the keyboard and tried screen sharing with the iPad again, and when it said it was authenticating, the mouse on the screen started rapidly changing between the standard cursor and the rainbow wheel. So I tried turning the keyboard on again and as soon as I did, the cursor came back and I got VNC to connect immediately. Then I tried turning on the keyboard and when this was all happening with the headphones, the keyboard would not connect. After a few minutes, the keyboard did connect, so I started googling and posting on forums and stuff and the modifier key problem came back. It took me forever turning off the option key to get a complete sentence out. After 10 or 15 minutes, things started working correctly again, so I’d go back to watching the movie, but after an hour or so it would all happen over again. 10/2/14 12:55:13.000 AM kernel: E:[AppleUSBBluetoothHCIController][InterruptReadHandler] immediate error (-536870175) queueing next read. 10/2/14 12:55:56.000 AM kernel: [[0x5150000] OpCode 0x0C19 from: SystemUIServer (176) status: 0x00 state: 2 timeout: 4321] Bluetooth warning: An HCI Req timeout occurred. 10/2/14 12:56:01.000 AM kernel: [[0x5150000] OpCode 0x1009 from: blued (27230) status: 0x00 state: 2 timeout: 4321] Bluetooth warning: An HCI Req timeout occurred. 10/2/14 12:56:06.000 AM kernel: [[0x5150000] OpCode 0x0C19 from: blued (27230) status: 0x00 state: 2 timeout: 4321] Bluetooth warning: An HCI Req timeout occurred. 10/2/14 12:56:10.000 AM kernel: [[0x5150000] OpCode 0x1009 from: blued (27230) status: 0x00 state: 2 timeout: 4321] Bluetooth warning: An HCI Req timeout occurred. The audio started working shortly there-after. I only had 3 minutes left in my movie, so I finished that off and hit the hay. Perhaps my BT antenna is going bad? Maybe that combined with the system update? I just made a genius Bar appointment so I can get to the bottom of this. If anyone has any ideas, please chime in in the comments. I’ll follow up when I have something to report.